Steve Tobin’s sculptures range in media and content, but what connects them is the sense of wonder that the work evokes. Tobin’s sculptures are often a result of an interaction with nature, presenting a unique view of objects or processes that could easily be overlooked, but which hold the power to drive and shape our world. The Termite Hill sculptures induce awe in their monumentality. The fact that insects make these architectural formations by mixing their own excrement with saliva adds a level of amazement that something so repellent could become so inspiring in form. The casts of the hills were made on-site, working with the local people in a village in Ghana, Africa to create molds that were transported to the United States where the bronze could be poured and patinated. The Roots series explores another aspect of what Tobin calls his Earth Bronzes. In these sculptures, Tobin extracts as much of an entire root structure of a dead tree as possible and casts it in bronze. That which was hidden under the ground is now presented before us in all its intricate glory. If you are from the New York City area, you may be familiar with Tobin’s sculpture Trinity Root, which was cast from the stump and root system of the 80 year old Sycamore tree that stood across the street from the World Trade Center. This tree was located in the historical churchyard of Trinity/St. Paul’s Chapel and was felled upon the impact of the falling towers. Amazingly, the tree saved the church and old tombstones from damage and subsequently Tobin cast this tree’s roots in bronze. This sculpture was dedicated on the four year anniversary of 9/11, in 2005. 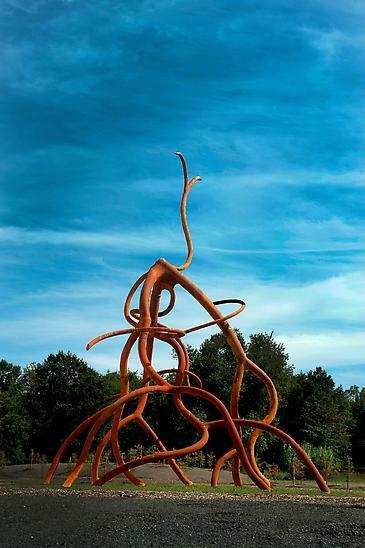 Although the sculpture Roots at Grounds For Sculpture looks similar to Trinity Root, it is not a replica of this piece and has no association with 9/11.